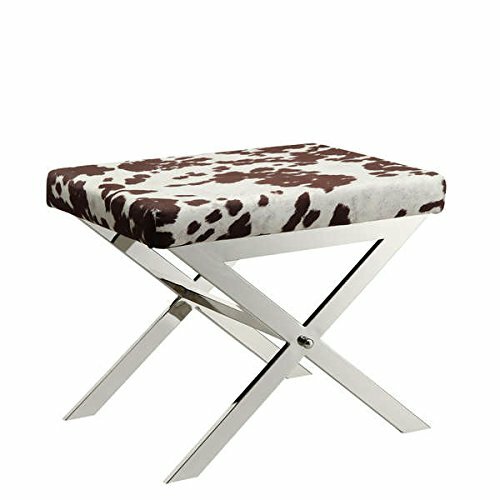 Cowhide Print 22-inch Metal Bench Made of Nickel-finished Chrome and Fabric, Use It As a Footstool in the Den, in the Living Room or a Fun Accent Table in a Teen's Bedroom. Ramp up the modern factor of your design scheme with the edgy appeal of the Southport stool from iNSPIRE Q Bold. From the gleaming shine of the chrome-finished, crossed-leg base to the western-inspired faux cowhide upholstery, this bold bench draws attention and acts as a focal point.